Developed for aesthetic professionals, the MedSCULPT body contour device by Alderm is fully approved by the U.S. Food and Drug Administration. The MedSCULPT is a Computerized Body Massage and M-Sonic Ultrasound Diathermy system designed to address the problem of cellulite. The technology advances the science of computerized and noninvasive body contouring. The MedSCULPT device combines ultrasound energy with massage of varying levels of intensity. The treatment is comfortable for patrons and effective for a number of conditions. The special resin-fabricated membrane intensely massages the skin and the subcutaneous layers below. This massage stimulates the blood and lymph system, which allows reabsorption of any liquids in stasis. The subcutaneous fat shifts as the membrane lifts up, folds, presses and stretches the skin. One of several computerized sequences directs this sequence. The operator can add ultrasound with this intense massage, using 1 MHz-frequency sound waves, ensuring deeper action on tissue. The ultrasound oscillates tissue particles, producing thermal and mechanical effects to break up fibers beneath the skin, improving tissue metabolism. SunrayLaser.com is proud to bring the Alderm MedSCULPT to our customers. We welcome any questions on the Alderm MedSCULPT or any other product line we represent. 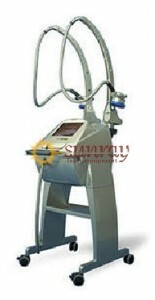 SunrayLaser is glad to provide price quotations on any make or model of aesthetic products. In keeping with our tradition of presenting only the finest refurbished equipment for the dermatological and aesthetic market. Our exacting technicians service and recondition each piece of equipment we sell. We won’t sell any piece of equipment unless it’s perfect and performs up to the manufacturer’s original standards. SunrayLaser’s cosmetic device consultants will be delighted to discuss our company and the devices we represent. We will explain how we can help you obtain the equipment you need at significant discounts. Just submit your contact information in the form below and one of our trained consultants will contact you immediately.